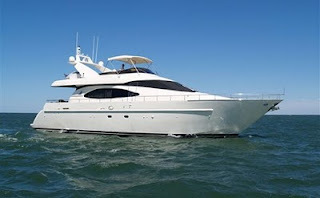 The 70' Azimut Motor Yacht SEAS THE MOMENT is offering a special for bookings out of Nassau during the month of June at a rate of $21,000/wk + expenses, which includes the 35' Marlago center console, rigged for fishing. Excellent charter reputation! No Delivery Fees! The main salon features wrap around sofas covered in fine Italian leather, a built in bar and large flat screen TV. Mid ship and across from the galley is a family style table which is perfect for cozy interior dining. As an alternative, guests may dine alfresco on the aft deck or spacious fly-bridge where there is a grill, refrigerator and large wrap around seating . Forward is a large sun pad for lounging or enjoying the panorama of a calm cruise. There is one 3-person Wave Runner for the more adventurous guests, or if you like fishing, diving, or water sports the 35' Marlago is a great asset to your charter. Master Stateroom: Located below deck aft with a king size bed and large flat screen TV, this master suite is spacious for this vessel's size. A lengthy master bath extends across the aft of the stateroom with marble detailing and a shower. VIP: Queen size bed forward most of the guest area below deck with en suite head/shower and full audio visual. Guest: 1 twin stateroom mid ship to port below deck with Pullman and head with shower. Fully equipped with audio visual entertainment. For questions about SEAS THE MOMENT, please click here.